The Sierra Club says that building more parking spaces, even for car-share, violates the city’s Transit First policy. Transit First is a 1973 initiative that puts public transit investment as the city’s top transportation priority, and is designed to discourage private automobile traffic. Apartment parking is hot commodity in San Francisco– under the current rules, developers can only build one space per unit. But for many San Franciscans, that’s not enough. A quick search on Craigslist shows people renting their coveted spots upwards of $300 a month. Now, the city is considering reducing that amount: a recent development on Market and Castro was allowed just one half of a parking spot per unit. The idea behind the restriction is to get people out of cars and into other methods of transportation, like Muni or biking. Before the new ordinance, car-share spots counted toward the development’s maximum. For example, the planned building on Market and Castro has 24 units, so that means 12 parking spaces. If the developer wanted to add a car-share spot, it would have to be included in that 12. Under the new ordinance, they could add between two to five spots designated for car-share only, on top of the 12. Instead of making new parking spots for car-share programs, The Sierra Club suggested converting existing street parking spots. But Supervisor Wiener’s office countered by offering studies that show that for each new car-share vehicle replaces between eight and ten private cars. In fact, a UC Berkeley study found that after signing up with a car-sharing program, almost half of households with a car got rid of their vehicle. 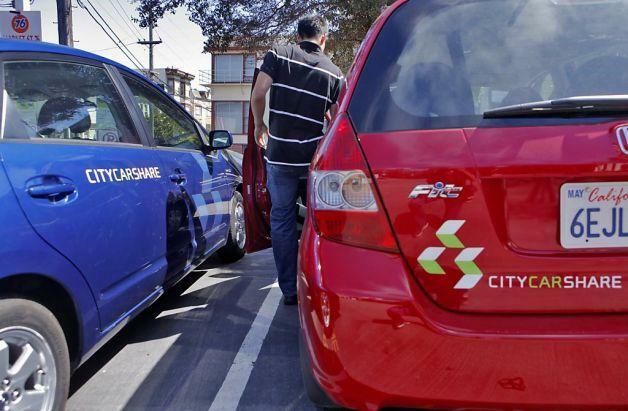 The San Francisco Supervisors hope that developers will take advantage of these new car-share spots. So do the city’s car-share members, who are seeing their usual spots at gas stations and open-air lots disappear as they get converted into buildings and other uses. Isabel Angell is KALW’s transportation reporter. You can find her work and more stories at transportationnation.org.